Written by Janet Choi on May 7, 2015 . When you lose motivation with a task or job, you may find yourself asking “why am I even doing this?” in the first place. Reasons equal motivation, including motivation to click through, reply, comply with your request, or even do you a favor. So are you making the most out of the power of “because” in your emails? Once compliance with the request required a modicum of effort on the subject’s part, thoughtful responding seemed to take the place of mindlessness, and the reason now seemed to matter. Almost any explanation motivates — but the bigger the ask, the more the quality of your reason matters. Despite being the participant of many-a-power-word list, “because” doesn’t seem very common in digital copywriting. Try testing using the word “because” in your emails and copy to motivate people to comply with your call to action. 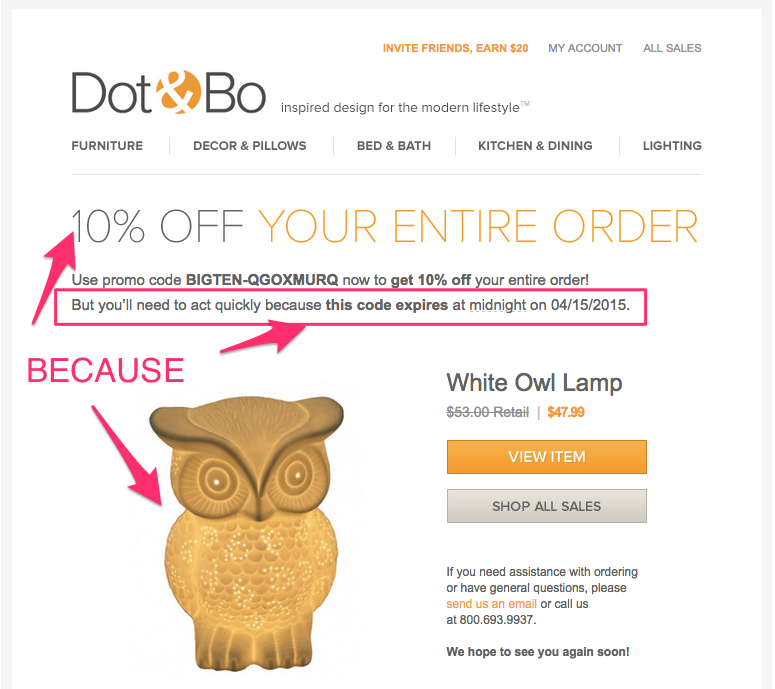 This cart abandonment email from Dot & Bo provides the good ol’ Cinderella rationale to act quickly — “because this code expires at midnight” within 2 weeks. The limited time discount is not the only “because” factor in this email. The cute owl lamp is not a random product but something I left in my shopping cart before leaving the site. This customization based on my behavior makes the message feel relevant and that this call to action is for me rather than any ol’ Joe Schmoe. ePantry provides a subscription service for sustainable household products. Their brand revolves around their mission to prioritize customer happiness and, as a B corp, social and environmental good. This strong company identity and purpose provides many reasons for customers to bite. This email with the subject line “We do things differently” is no exception. This is a good example of the “because I have to make more copies” rationale. 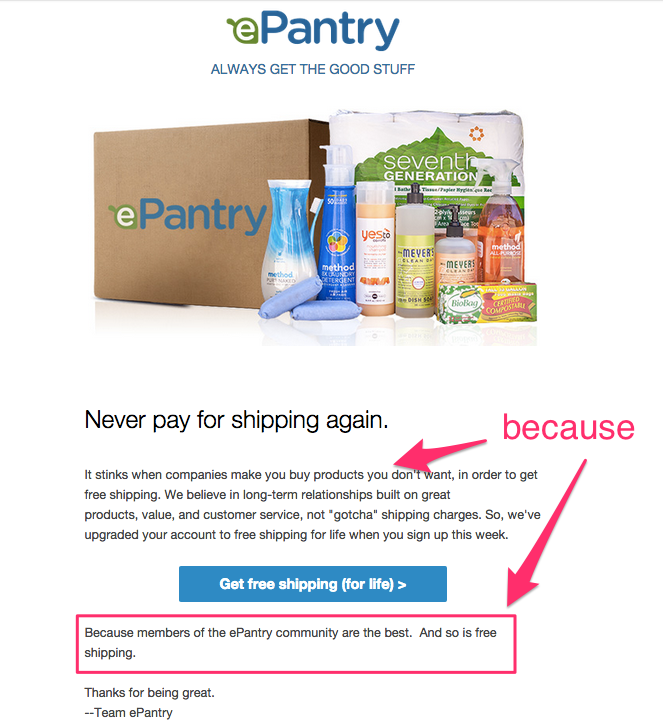 While I don’t doubt that ePantry believes its community members are the best, that reason is also not specific or compelling on its own. It works, given the company’s consistent mission and messaging, the sweetener incentive of free shipping, and the feeling of special treatment — a mix that has worked so successfully for companies like Zappos. Stitchfix offers affordable personal styling services for women. As part of the sign up process, you have to fill out a personal style profile to share your sense of taste, budget, size, and lifestyle. 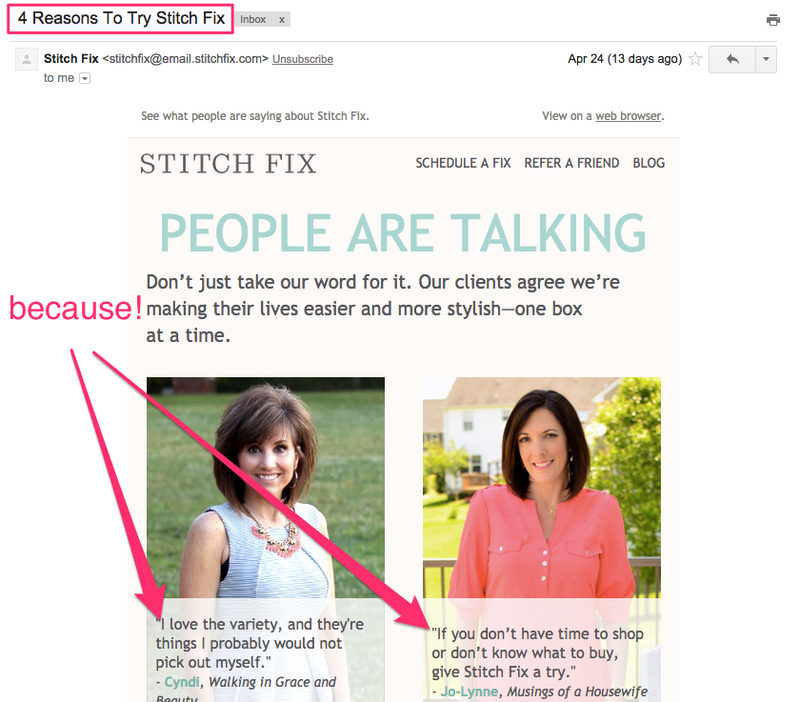 Instead of bugging me right away with a generic “please complete your profile” nudge, Stitchfix sent me 4 reasons to get moving from happy customers. Your happiest customers have already found reasons that resonate — and they’ll probably say it best. In its newsletter, Unbounce sends updates on their newest, best content. In a smart move, the company also connects its content audience to its product by including a call to action in every postscript. 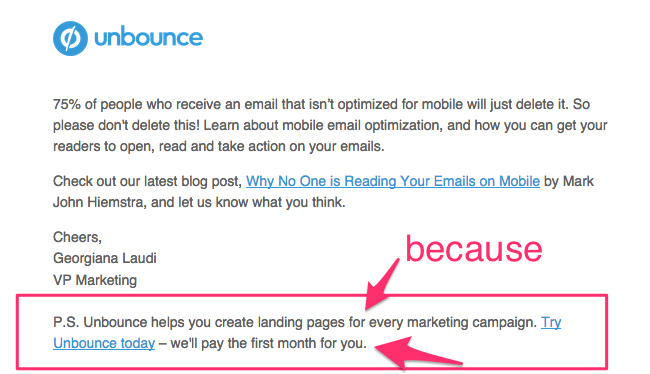 While there’s no explicit “because” statement — there’s a reason (Unbounce will help you solve the problem of creating marketing landing pages) that leads right up to the pitch to “try Unbounce today.” Notice how they follow through with what sounds like an incentive. “We’ll pay the first month for you” sounds like a more compelling reason to act than the usual “free trial” angle. EVERYONE CARE ABOUT SELF FIRST. TAKE HINT. CARE ABOUT THEM FIRST TOO. WHOLE POINT OF COMMUNICATE? THEM. WITHOUT A THEM THERE NO COMMUNICATE. IT JUST OTHER WORD END IN “ATE”.